This month, 13 women graduated from the SHE Growth Accelerator, at the British Ambassador's Residence in Phnom Penh. 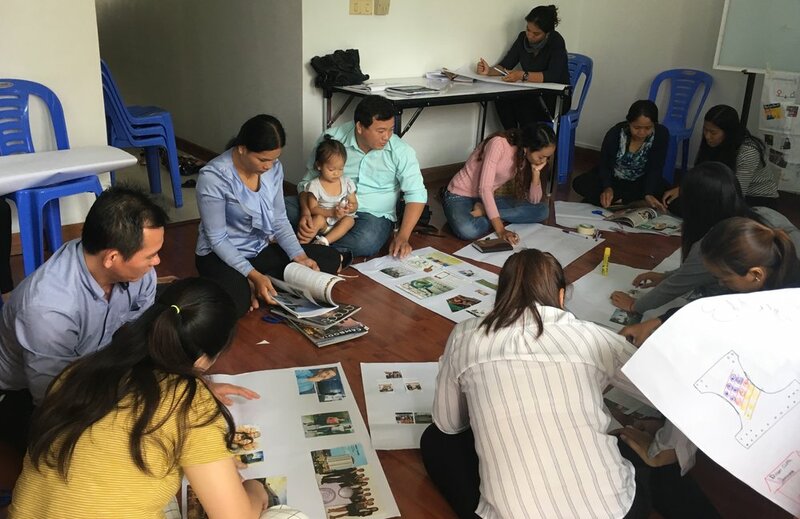 This program was Cambodia's first Accelerator designed to position women-led businesses for growth, and support them to transition into the formal economy by helping them to register their businesses. Less than 2% of women's businesses are registered in Cambodia. This means they can't access formal bank loans or investment, they can't legally export products, and they can't formally employ people under Cambodia's labour laws. Srey Sung Kam, Founder of Cambodian Pepper Farm "Family Plantation", and new tech startup "MyApp Service"
The pilot SHE Growth Accelerator was funded by The British Embassy; a 6-month intensive business training and consulting program, during which participants attended more than 90 hours of workshops, coaching and consulting sessions. They worked with SHE's lead Accelerator Program Facilitators, as well as our Senior Business Consultant, to give them group and 1:1 attention to help them scale their business and support them through the registration process. SHE Investments' work is focused on not only accelerating businesses, to help women bridge the SME sector in Cambodia; it is also concentrated on promoting and celebrating women as leaders and role models, and demonstrating the opportunity for scaling up the largely female-dominated MSME sector in emerging economies. The return on investment for this program, if we look at the number of new jobs created and increased collective revenue being contributed to Cambodia's economy each month, is more than three times it's original budget (and these women only just graduated 10 days ago). 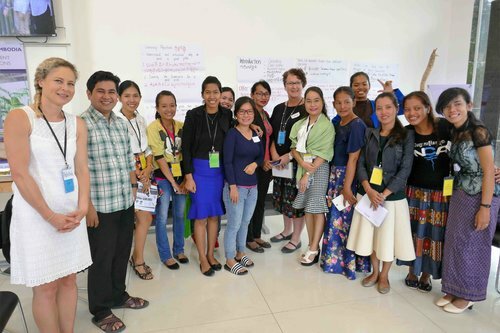 Imagine what could be achieved if women in the informal MSME sector across the Asia-Pacific had access to tailored support structures designed to facilitate their business growth, and the wider impact for communities and the regional economy. SHE Conference 2018 - "The Benefits of Gender-lens Investing have Strong Ripple Effects"
Although women account for about 50% of the working age population, labor force participation among women is persistently below that of men, and women perform a higher share of unpaid work. In recent years, we’ve made great advancements in providing access to unbanked communities and individuals, but far less progress has been made in closing the gender gap in terms of financial access. In Cambodia, women run roughly 65% of the micro- and small-sized businesses. One of the biggest barriers to growth for these businesses is lack of finance. Investments in girls and women is not only a stepping stone in their empowerment and opportunity to reach their full potential in society; it also creates ripple effects of benefits for entire families, communities and countries and can help improve labor market outcomes more broadly. When women fall behind, so do families and societies. Research on the topic shows that female business-owners are better at reinvesting profits into their businesses, strengthening local communities and investing in their children’s health and education. While economic empowerment among women does not guarantee gender equality, it is a vital part in women’s ability to negotiate improvements in their well-being. This year’s SHE Conference is centered specifically on the theme of ‘Investing in Women’. The SHE conference is an annual platform where female entrepreneurs, students, government officials and organizations discuss women’s economic empowerment. 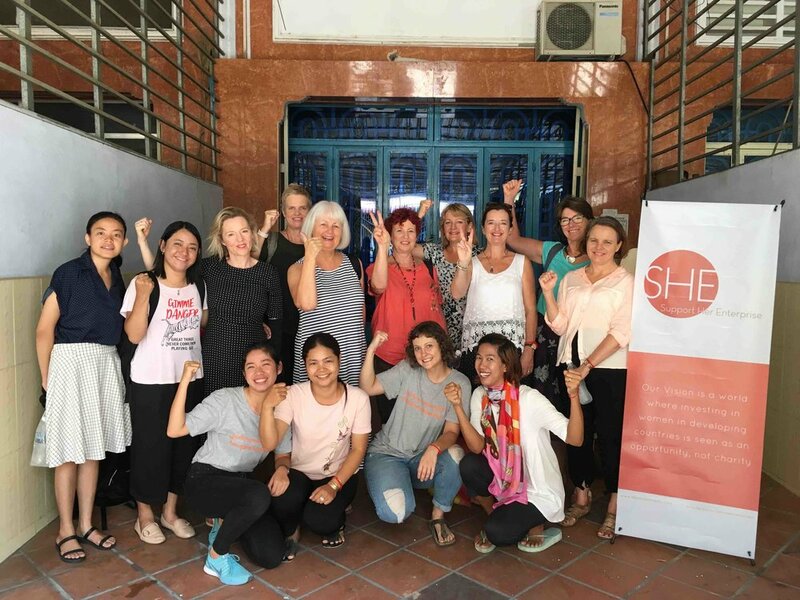 Launched only three years ago, the SHE Conference is becoming the largest celebration of female entrepreneurs in Cambodia bringing together more than 150 people each year to promote and celebrate women's entrepreneurship. Interested in attending? Find out more here. សូមរួសរាន់ឡើងមក ចុះឈ្មោះ ឥលូវនេះដើម្បីទទួលបានអាហារូបករណ៏ 100% ! ប្រសិនបើអ្នកជាម្ចាស់អាជីវកម្មខ្នាតតូច និង មធ្យម កំពុងជួបការលំបាកក្នុងសង្វាក់ផលិតកម្ម ដោយខ្វះគ្រឿងម៉ាស៊ីន ឬ ឧបករណ៍នានា នោះកម្មវិធីស្រាវគឺជាដំណោះស្រាយដ៏ល្អ! Three essential reasons for how coaching will improve your business! There is no doubt that professional coaching can be useful towards reaching professional and personal goals. Late April the SHE Investments team welcomed professional coaches from Australia and New Zealand for the SHE Coaches Tour. It was a very insightful week for our participants, who received coaching on their businesses through field visits, workshops and one on one sessions. These sessions proved to be extremely beneficial and provided a wealth of information and actionable takeaways for SHE participants to not only improve their business operations but set realistic goals in their daily lives. From our positive experience with coaching, we wanted to share with you our top three reasons why we would recommend coaching for you and your business. Coaching is a non-judgement process that aims to empower coachees to discuss challenging topics experienced in our daily life/business. Creating a safe and trusting space is crucial for this type of conversation to occur. Developing trust enables coaches and coachees to open up about our current situations and feelings and to start recognising how it is impacting our life. Speaking about our concerns or questions we may have about running our organisation starts the process to move forward by finding solutions to address these challenges. Have you ever found that your thoughts were clouded by your perspective on a situation? Coaching can allow you to see your problem or challenge from another viewpoint and therefore discover the reality of the situation. It is once this new perspective is determined, you will then be able to implement actionable strategies that are relevant to the outcomes that you would like to achieve. Finally, a productive coaching session will leave you with actionable steps to take forward into your work and life. An important aspect of this stage is to make sure you take time to develop strategies to help you achieve the desired outcome. More often this is an ongoing process determining whether your strategies being implemented are effective or if not, reassessing what may need to do to achieve your goals. A way to do this could be to create a behavioural action plan or maintain a journal to use as a reflection tool. Both these can be helpful in keeping you accountable during the process. សំណួរ៖ តើកញ្ញាស្គាល់ ស៊ី អ៊ិនវេសមិន (SHE Investments) តាមរយៈណាដែរ? សំណួរ៖ ចុះហេតុអ្វីបានជាបងសម្រេចចិត្តក្នុងការចូលរួមវគ្គបណ្តុះបណ្តាលអាជីវកម្មថ្នាក់មូលដ្ឋាននៅ ស៊ី អ៊ិនវេសមិន (SHE Investments)? សំណួរ៖ សូមរៀបរាប់ពាក្យបីម៉ាត់ដែលកញ្ញាចង់បង្ហាញពីអារម្មណ៍ក្រោយទទួលបានវគ្គបណ្តុះបណ្តាលពីស៊ី អ៊ិនវេសមិន (SHE Investments)? សំណួរ៖ សូមបរិយាយពាក្យមួយឃ្លាដែលបានដែលបានផ្លាស់ប្តូរជីវិត ក៏ដូចជាអាជីវកម្មរបស់កញ្ញាតាមរយៈការចូលរួមវគ្គបណ្តុះបណ្តាល ស៊ី អ៊ិនវេសមិន (SHE Investments)? 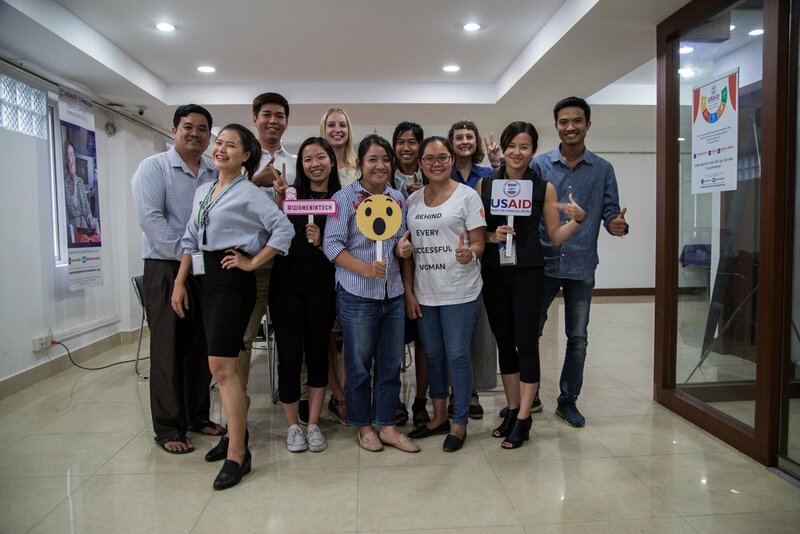 Suong Sovathana started E House App, a service that assists provincial students and workers who have migrated to Phnom Penh to find accommodation, after facing difficulty finding a safe and affordable place to rent while she was studying in university. E House App acts as a middleman, sourcing safe and affordable rooms and apartments for rent, creating agreements with the landlords and then referring them to students and workers. Sovathana graduated from SHE Incubator Program in 2016, and has been working on further developing her business. She is in middle of launching a mobile application to make this service more accessible to students and workers in need of accommodation in Phnom Penh. The following interview will give you a glimpse of her journey to accomplishing her goals. We started doing our market research in 2015, and have been fully operational since January of 2017. I attended the SHE Conference and heard about SHE’s Business Training programs. I decided to join because I was interested in business development and because SHE offered a scholarship to be part of the program, which allowed me to participate. What has been the greatest challenge you have faced since deciding to run your own business? My team and I worked on our market research but we lacked capital to make our idea come to life. The support and encouragement that I received during SHE’s Incubator Program boosted my confidence. My team and I were able to present our idea in a competition and won the prize that allowed us to make our business operational. Currently, we are getting ready to launch our mobile application that will make it even easier for young people to find safe and affordable housing in Phnom Penh. I would advise them to find a good partner, whether it’s a friend or family member, build a good team, and fully commit yourself to your businesses. In three words, what did the SHE’s program bring you? In 1 sentence, how did the program change your life or business? I have more confidence in myself now. I have understood how important networking is and I am using the skills I learned during SHE’s program to build my network. Would you recommend SHE’s program to others? Why? Yes, everyone who is interested in developing their personal skills and improving their business, I highly encourage them to join the program! Thank you,Sovathana for sharing your story with us today. We are proud to support women like you to scale your business and create a positive impact in your community. អី្វដែលសំខាន់បំផុត បើយើងនៅតែបន្តក្នុងការគាំទ្រដល់សហគ្រិនស្រីនោះមានមានន័យថា 50% នៃប្រជាជនសរុបកំពុងចូលរួមចំណែកដល់ការអភិវឌ្ឍសេដ្ឋកិច្ចរបស់ប្រទេស។ ស្រមៃមើលថា បើសិនកម្រិតនៃការអាចពង្រីកអាជីវកម្មរបស់ស្ត្រីមានភាពដូចគ្នាទៅនឹងបុរសបច្ចុប្បន្ន នោះផលប៉ះពាល់វិជ្ជមានជាច្រើននឹងកើតមានឡើង! សំណួរ: តើកញ្ញាស្គាល់ សីុ អិុនវេសមិន (SHE Investments) តាមរយៈណាដែរ? សំណួរ: ហេតុអ្វីកញ្ញាសម្រេចចិត្តចូលរួមវគ្គបណ្តុះបណ្តាលអាជីវកម្មខ្នាតតូចនៅសីុ អិុនវេសមិន (SHE Investments)? សំណួរ: តើមានអ្វីខ្លះដែលបានផ្លាស់ប្តូរបន្ទាប់ពីកញ្ញាបានបញ្ចប់វគ្គបណ្តុះបណ្តាលនៅ សីុ អិុនវេសមិន (SHE Investments)? សំណួរ: សូមរៀបរាប់ពាក្យបីម៉ាត់ដែលបង្ហាញពីអារម្មណ៍របស់កញ្ញាពីវគ្គបណ្តុះបណ្តាលអាជីវកម្ម សីុ អិុនវេសមិន (SHE Investments)? សំណួរ: តើកញ្ញានឹងណែនាំសហគ្រិនដទៃទៀតឲ្យចូលរួមវគ្គបណ្តុះបណ្តាលនៅ សីុ អិុនវេសមិន (SHE Investments) ដែរឬទេ? Kang Samnang has been operating Khmer Creations for about nine years. Khmer Creations generates skills and income for their employees, enabling them to have a brighter future. Samnang joined the SHE Incubator in 2016 to further develop her business management skills and be able to grow her businesses. Her ultimate goal is to “work with more women in the community to lead them from poverty into a bright future.” Samnang was interviewed by SHE team on her progress and challenges of running her business post-graduating the SHE program. How did you hear about SHE Investments? I heard about SHE from my director and advisor. I decided to join SHE to learn more about how to operate my business and how to improve and develop it further. Since graduating from SHE’s Incubator Program, I’ve been able to build a better network, and I have received a lot of support from advisors about running my business. My biggest challenge was Human Resource Management – I had a lot of conflicts with the staff. But I have learned to calm myself during these situations so that I won't make rash decisions. Be mentally prepared, don’t work with friends or relatives, be strong in making decisions, and work on your management skills. Since the program ended, I could say that I am now more open to people I meet. I would recommend SHE to a starter or small business. SHE can help and mentor them regarding what it requires to do the business. Thank you, Samnang for sharing your story with us today. We are proud to support women like you to scale your business and create a positive impact in your community.